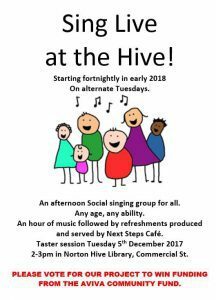 Starting in January 2018 Next Steps working together with Norton Hive, is presenting “Sing Live at the Hive”. This will be held at Norton Hive (the old library) and will include such things as live music and a pop-up café. Further details to follow.